Personalized Name(s): Name(s) to be added by author. Easy to use, illustrated field guide to the common plants and animals found throughout the Adirondacks. 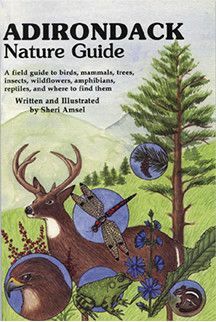 Includes: mammals, birds, insects, amphibians, reptiles, wildflowers and trees. 120 pages, Full color images. Giving this book as a gift? If you wish, the author can sign and personalize this book. When adding to your basket, please list name(s) in the field above. View more of Sheri Amsel's exploring nature educational resources (Life Science, Earth Science, and Physical Science Resources for K-12) at exploringnature.org.